3 bedroom accomodation ideal for small family plus grandparents. With hot tub. Enjoy a rural farm setting with small animals in clean surroundings! Sticklinch Farm Cottage is a 4 star (Quality in Tourism) self-catering annex to a Farmhouse with views of the Mendip Hills to the north and Pennard Hill to the south. It is very near the Cathedral City of Wells, Glastonbury Tor and only 35 minutes from the coast. Accommodation available for Glastonbury Music Festival. (contact owners for details). It is also 10 mins from the Royal Bath & West Showground at Shepton Mallet and 15 mins from the Clarkes Village Outlet Shopping. The cities of Bristol and Bath are within easy driving distance. The long distance footpath, the Monarch Way, is adjacent to the property so is ideal for walkers. The owners Chris and Jan have a variety of small animals on their 4 acre smallholding, including sheep, ducks , geese, hens, pigmy goats, cats and Peter the collie who loves to play ball. A children's paradise! Visitors are welcome to walk up the paddock to see the wonderful sunset with views towards the Somerset coast and the Mendip Hills. Sticklinch Farm Cottage is a relatively new accomodation with views over towards the Mendips to the north and the West Pennard Hills to the south. The flexible accomodation is ideal for a family of 4-5 or a couple with or without children. It's additional ground floor twin room with its own shower and toilet is ideal for grandparents or teenagers! Main Accomodation: large entrance hall with storage space for coats, boots, pushchairs etc, stairs leading to large lounge with a kitchen/diner, double bedroom with king size bed, ensuite bathroom with shower/bath, further very small single bedroom (ideal for child). Additional downstairs accomodation (separate entrance across a small courtyard): Entrance Hall, Bedroom with twin beds, sitting area, french windows onto courtyard, Superb walk in shower wet room, Separate toilet with basin. Outside: courtyard with garden furniture, patio area with hot tub. Access to lawns and paddock, off road parking, garage storage for bikes etc. 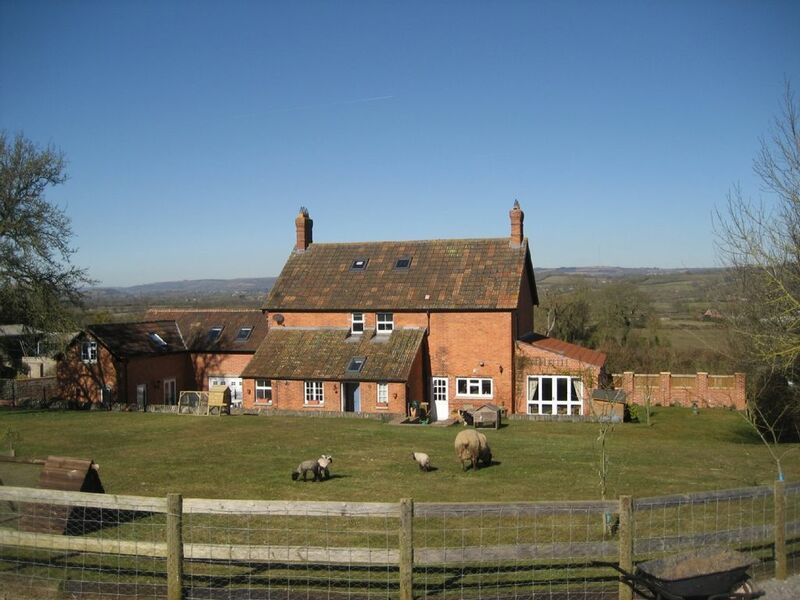 We reside on the premises at Sticklinch Farm and have lived in Somerset for over 13 years. Our married daughter, Anna, lives nearby in Wells with our four grandchildren. We have two married sons - Andrew and Robert both qualified GPs. Chris and Jan have both recently retired. We enjoy the relaxed lifestyle in Somerset and have developed the 4 acre plot to accommodate our growing number of small farm animals. Our paddock extends at the rear up towards West Pennard Hill. Our flock of sheep are very friendly and will allow you to tickle their chins with a little help from some sheep nuts! We have Hampshire Downs sheep which this year produced 12 lambs between them! Also around the small holding are four pigmy goats. We have a variety of hens and ducks producing fresh eggs. You could also try goose eggs from our Pilgrim geese. We own a friendly Border Collie called Peter, who loves playing ball games with children ,and some gorgeous looking cats. We are very happy to show you around the small holding and chat about the good life! Having lived previously near London, we often talked about escaping to the country and in 2005 , we did it! Somerset is so laid back and friendly but we can still catch a train and get to London to enjoy concerts. Bristol and Bath are also cultural centers nearby. Where else can you sit out in a hot tub under a clear sky and gaze at the stars without any light pollution ! Bathroom off double bedroom with shower/bath, basin and toilet. Downstairs in the additional accomodation is a superb walk in shower wet room and separate toilet adjoining the twin bedroom. Courtyard area with outside patio table plus terrace housing the hot tub. Twin bedroom downstairs has its own entrance onto a small courtyard. Ideal for couples or grandparents or teenagers. Newly fitted in 2013 - for use of guests who should provide their own towels. Private location. Up to 5 guests at a time. I visited with my two daughters (10 and 8 in age) who both love animals! My youngest loved playing with Peter the Border Collie every day (and would quite happily have brought him home!) and my eldest enjoyed sitting inside the bunny hutch cuddling the 3 fluffies! We all got to hold a lamb and loved the cheeky goats! The property is well situated for visiting so many places; i didn't like to drag the girls away from the animals too much so opted to only visit a few places but now have many more on my list for another visit! We used the hot tub twice, (not bad for early April!) and found it all hugely relaxing, with a lovely view! My Dad came down to join us for a night which Chris and Jan accommodated well, and didn't mind having to change sheets etc for only one night! We used the laundry machine too whilst there, and all in all felt a home-from-home atmosphere. I had this place recommended to me and would not hesitate to recommend to others for some peace, quiet, walking, animals to play with and family time. Thank you Chris and Jan! We had a great stay. The set-up is perhaps slightly unusual as the two main bedrooms are accessed via separate doors - but it's very close, a baby monitor works between the downstairs bedroom and the upstairs living room. The hot tub was a real treat and our child loved meeting the animals. There's lots to do in the area. We are glad you enjoyed your stay at Sticklinch and appreciated the animals. We have found that the ground floor accommodation with its own entrance works well for family groups, especially those with grandparents or teenagers, allowing them the freedom to come and go without disturbing others in the upstairs rooms! It was lovely to meet you and glad you enjoyed your stay here. You would be most welcome to return ! We stayed here over the New Year and really enjoyed the stay. The place has been really well designed and furnished, good sized rooms but still a cosy feel. It was well equipped, there was everything you need including a properly equipped kitchen instead of these 'show kitchens' that seem to often be found these days in holiday lets. A nice big sitting room upstairs with good views, a good bedroom with heated mattress although the heating was very good so that wasn't required. The bedroom blacks out completely with the blinds so it's very easy to have a good sleep. The hot tub was great, and the walk-in shower next to it very convenient. The owners were really friendly and the animals were good to watch, it's not everywhere that you can sit in a hot tub watching goats, rabbits, geese and ducks wondering around. Also really well located for Glastonbury, Wells and other various walks we had whilst here. We hope to return in the future. We are really glad you enjoyed your New Year break here at Sticklinch and look forward to welcoming you back again next year! The hosts were lovely and showed us around when we arrived explaining everything. The place was clean and well presented. Lovely place to stay, would recommend it. Sadly due to the weather when we stayed we didn't get a chance to use the hot tub so cannot comment on that but it looked lovely and warm. We have an electric car and they had no problem with us running the cable through the garage to charge up every night. Thank you for a lovely stay. We are glad that you enjoyed your stay! It was a shame that the windy weather meant that the hot tub couldn't be used. Maybe you can return another time to enjoy better weather! Stayed here for nearly 2 weeks. Was made to feel welcome by the owners who live next door. Was easy to find. There is parking for 2 cars. The main living area is very spacious, light and airy making full use of the skylighting. I’ve never been a huge fan of open plan living but I actually liked the layout in the apartment to the point I would consider it in the future. For the people who like their gadgets, tv etc be warned the tv is basic with scart inputs. Not able to use my amazon fire stick. In the apartment there is a larder fridge with ice box compartment. The kitchen has enough utensils for 5 people. There is a single fan oven that was easy to use and an induction hob. As you enter the building at ground floor level there is a door that leads to the owners garage. In here there is a chest freezer you can also use along with washing machine and tumble drier. The main bedroom again continues to be spacious and airy using the skylights. Bed was a king size and comfortable. Nice touch by the owners with cold nights coming by putting electric blankets on the beds. Main bathroom is accessed via the bedroom so as my mum stayed with me for part of the visit I had to make the bed. Lol. Good water pressure throughout. Bath is a nice size. Fortunately I’m only 5’ 5” so I was able to use the shower without hitting my head due to the sloping ceilings of the roof. My husband who is 5’ 10” used the shower in the downstairs annexe. The downstairs annexe consists of a separate bathroom, walk in shower room, and then bedroom with 2 single beds and double patio doors that open up on to the courtyard. In the entrance space to this there is a sink and a kettle. What would make this area perfect would be a small fridge to store some milk overnight that way you don’t have to go into main accommodation when you 1st wake up to get your caffeine fix. This also presented another small challenge at night. There is 1 separate key for the main apartment and 1 for the annexe. At night my mum had to take the main apartment key, lock me in so she could then access the main building in the morning if I was asleep. Overall it was a good stay, very quiet in comparison with living in London. Would not hesitate in recommending this to others. Lovely walks both local and on Mendips - details available in cottage. Somerset marked cycle routes nearby. Somerset coast (40 mins). Devon coast (north and south) ( 1 hour). Wells Cathedral City - a real must to visit (20 mins). Glastonbury Tor and Abbey (10 mins). Somerset flats with Nature Reserves - special event - see the starlings aerobatic display from Nov to Feb. Cheddar Gorge and Wookey Hole Caves (30 mins). Clarkes Village Shopping Outlet centre (15 mins). Bath & West Showground (10 mins). Bristol city (45 mins). Historic Bath (40 mins). Longleat House (30 mins). Yeovilton Air Museum (30 mins). Golf and Horse Riding activities nearby.